Jean Reddaway nee Brett studied at the Slade followed by an art teachers Diploma and taught at Impington Village college. She married Norman Reddaway, who after an exciting war joined the Foreign Office, and was Ambassador in Poland 1974 -78. 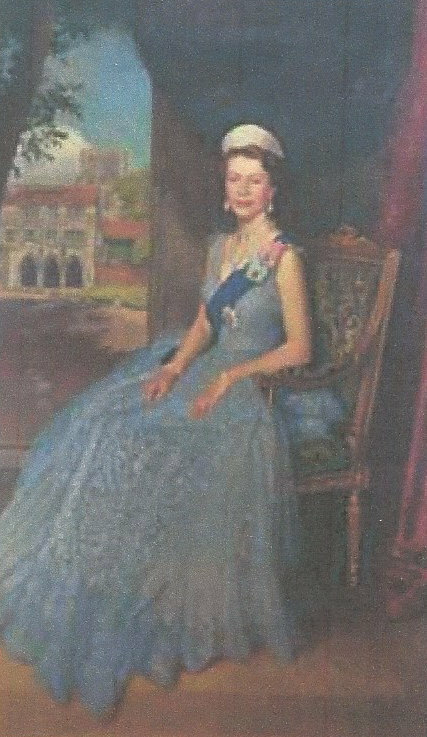 Jean was awarded the OBE and the Polish Order of Merit for her contribution to Anglo Polish relations and the painting of Polish subjects In their retirement the Reddaways lived in Carlton Hill and now Jean lives in a flat in the same road, and still exhibits her paintings locally. Edward Irvine Halliday (1902-1984) was born in Liverpool and trained at the Royal College of Art and the British School of Rome. He was a mural painter in the 1920s and then turned to portraits, combined with broadcasting. He was the first voice of the TV newsreel and used to paint in the morning and broadcast in the afternoon. In 1946 he and his family (including daughter Charlotte who is now a well known painter, particularly of St Johns Wood houses) lived at 42 Acacia Road and then in 1949 they moved to 62 Hamilton Terrace ,which had a large studio in the garden. 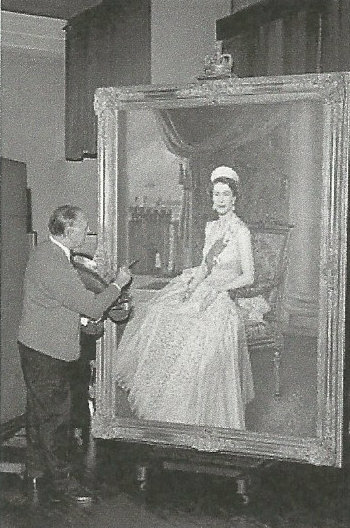 From 1971 -1980 he was president of the Royal Society of Portrait Painters and painted many famous people, including the Queen. But in 1939 when Jean was a schoolgirl in North Wales the buildings of her school Penrhos College were taken over by the Ministry of Food and all the girls and teachers moved to Chatsworth in the Peak District, where the school stayed until 1946. As the Duchess of Devonshire wrote in 2002 The Painted Hall was used for assemblies and prayers, the Orangery became the art room, physics was taught in the butler’s pantry, biology in the still room and chemistry – for safety’s sake – in the Stables. Dormitories were scattered throughout the house. Up to twenty girls slept in the State Drawing Room. 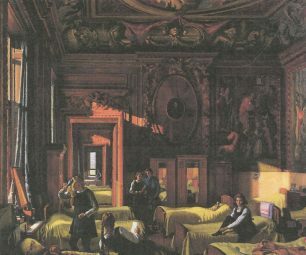 And Edward Halliday painted Chatsworth in Wartime, showing the State Drawing room being used as a dormitory, with Jean Reddaway brushing her hair in the bottom left hand corner. This page was added on 19/01/2017.